In celebration of our 75th Anniversary, the Junior League of the Palm Beaches has taken on a special community project for the 2015-16 League Year: Vita Nova Extreme Home Makeover! 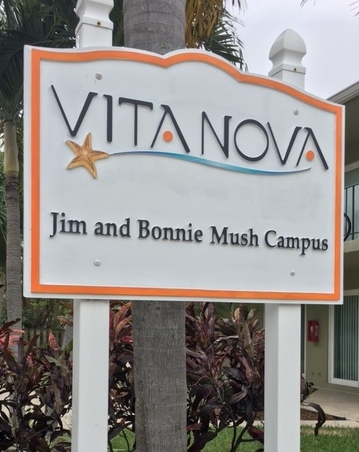 The village is a dormitory style living facility in West Palm Beach for 27 boys and girls, ages 18-25, that have aged out of the foster care system and would be homeless without this program’s help. At Vita Nova, residents learn basic life skills training along with virtues-based critical thinking skills, so our residents can transition into life as an adult. Phase 4, the renovations for the Common Area space, will begin in January 2017. We are currently looking for sponsors in order to fund these renovations. Please contact Natasha Rawding at extrememakeover@jlpb.org for further details and opportunities. Phase 3 will begin renovations this summer. These 4 apartments are 3 bedroom units, which are “home” to 12 residents. We anticipate The Breakers will be donating their services to paint these units and the new committee will be chipping in to clean and furnish the units thereafter. We would like to thank ECM (East Coast Mechanical), Jordan Giving Hope and Ellis Parker for sponsoring these units and making this dream a reality. Phase 2 of the Vita Nova Extreme Makeover is complete. A total of 8 living units have been painted, patched, repaired, cleaned and fully furnished with brand new IKEA furniture and accessories. Active member, Catherine Anido, donated a brand new BBQ grill and propane tank from Lowes. The VN Residents are looking forward to hosting their very first BBQ this summer. We have completed 4 out of 12 units and now have 11 out of the 12 sponsored. We will be working on unit 5 starting in January. We raised over $3,500 at the Palm Beach Jewelry and Antique Show for the project – these funds will go towards much needed items such as washers and dryers, and other shared needs for the residents. We have completed make-overs on a quarter of the units (3 of 12)! In addition to all of the great work that’s being done, the committee–together with volunteers from JLPB and the community–continue to pool resources to keep the momentum going. Monthly cleaning days provide an opportunity for volunteers to work alongside the residents of Vita Nova. We have also asked a local artist to provide paintings for each of the rooms. If you’d like to read the press release, click here.